On July 12, the National Assembly of Venezuela discussed a security plan that was implemented a year ago. Citizens who spoke up in the session, blaming the police as a source of voilence. Venezuela holds a place among the three top countries with the highest murder rates (El Salvador and Honduras often share the podium), and it has for several years in a row. With an average of 25,000 murders reported yearly, reality strikes hard when you compare that rate to countries like Ethiopia and Nigeria that are currently holding wars against terrorism, and yet have lower murder rates. Crime, murder rates and social insecurity as a whole being the top issues for Venezuelans, back in July 2015, the 25th Security Plan to combat these problems was brought into action­, as the 24 previous plans failed invariably­ by the Ministry of Interior, Justice and Peace. This most recent plan was named “Operation for the Liberation and Protection of the People” (OLP), and it was developed as a multi-task effort made by all elements of public force (Armed Forces, Intelligence Service, Bolivarian National Police), aimed at dismantling organized delinquency groups operating in popular areas, generating criminal activities like “planned in Colombia”, which included activities such as extortion, kidnapping and contract killing. Minister of Interior, Justice and Peace, Gustavo González, said back in 2015 that the objective was to “free the territory of all illegal activities, and to protect the people”. 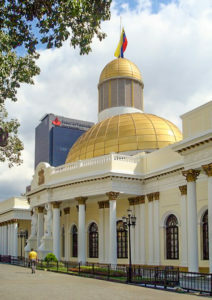 One year after the implementation of OLPs, on July 12th 2016, a debate was held in the National Assembly of Venezuela, the highest legislative body, to discuss whether or not the plan was being executed according to due process, the Constitution, and human rights, and if the effectiveness of the plan was noticeable. The “Victims of the OLP Committe” were invited to speak up during the debate. They shared stories about police brutality, extrajudicial executions, theft, arbitrary detentions and other forms of abuse in which the joint state forces have incurred during the implementation of the operations. Emily León, 23 years, and a mother of two children (8 and 6 years old), was the first to raise her voice. Last year, she narrated, several men entered her home at 4:00 am in the morning, knocking down her door; they allegedly had a Presidential mandate to enter any residence during the operatives. They took her outside, and while searching the entire house, they placed all of her belongings in a truck, and said that they were transporting everything to a shelter were all residents of the zone were to be placed–But that never happened. She was taken by the police forces and imprisoned for 47 days with absolutely no evidence of having performed any illegal activities. By the time she was released and the charges against her dropped, her home had been demolished, and all of her belongings “misplaced”, never to be found. Emily and her two children are still homeless. Her voice cracked as she stated: “Officials working on OLPs are human rights violation machines”. Next to her stood Olga Mesa, the mother of a 16 year old boy killed during the operatives. She sent a message to the the official Party representatives at the Assembly, and the President himself: “You took away my house, my things, my son. The government took away my son through the OLP, but they cannot bring him back to me, no matter what they do”. Delsa Solórzano, deputy to the National Assembly and President of the Commission of Interior, stated during her speech in the Plenary Session that “OLPs are a consequence of having had militarized all levels of security in the country and leaving local security to the Armed Forces”, who are often linked to human rights violations. The National Assembly, after hearing the statements of the victims, debated for about an hour on the subject. The session concluded with the approval of an “Agreement Against the Operations for the Liberation and Protection of the People”, document that recommended the abolition of such practices, and declared the failure of the 25th Security Plan proposed by the Ministry of Interior: OLPs.